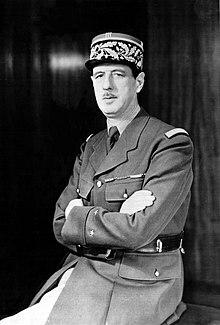 Gaullism (French: Gaullisme) is a French political stance based on the thought and action of World War II French Resistance leader General Charles de Gaulle, who would become the founding President of the Fifth French Republic. Serge Berstein writes that Gaullism is "neither a doctrine nor a political ideology" and cannot be considered either left or right. Rather, "considering its historical progression, it is a pragmatic exercise of power that is neither free from contradictions nor of concessions to momentary necessity, even if the imperious word of the general gives to the practice of Gaullism the allure of a program that seems profound and fully realized." Gaullism is "a peculiarly French phenomenon, without doubt the quintessential French political phenomenon of the twentieth century." Lawrence D. Kritzman writes that Gaullism may be seen as a form of French patriotism in the tradition of Jules Michelet. He writes: "Aligned on the political spectrum with the Right, Gaullism was committed nevertheless to the republican values of the Revolution, and so distanced itself from the particularist ambitions of the traditional Right and its xenophobic causes, Gaullism saw as its mission the affirmation of national sovereignty and unity, which was diametrically opposed to the divisiveness created by the leftist commitment to class struggle." The first phase (1940–45) occurred during World War II. In this period, Gaullism is identified with those French who rejected the armistice with Nazi Germany and the Vichy collaborators led by Philippe Pétain, and joined with General Charles de Gaulle and the Free French Forces, who sought to put France back in the war on the Allied side. In the second phase (1946–1958), Gaullism was a type of opposition to the Fourth French Republic. Gaullists in this period challenged the unstable parliamentary government of the Fourth Republic and advocated its replacement with "a president of the republic with preeminent constitutional powers." In the third phase (1958–69), "Gaullism was nothing other than the support given to the general's own politics after he returned to power in 1958 and served as president of the newly formed Fifth Republic from 1959 until his resignation in 1969." Since 1969, Gaullism is used to describe those identified as heirs to de Gaulle's ideas. The "fundamental principle" of Gaullism is a "certain idea of France" as a strong state. This idea appears in de Gaulle's War Memoirs, in which he describes France as "an indomitable entity, a 'person' with whom a mystical dialogue was maintained throughout history. The goal of Gaullism, therefore, is to give precedence to its interests, to ensure that the voice is heard, to make it respected, and to assure its survival … to remain worthy of its past, the nation must endow itself with a powerful state." Kritzman writes that "the Gaullist idea of France set out to restore the honor of the nation and affirm its grandeur and independence" with de Gaulle seeking to "construct a messianic vision of France's historic destiny, reaffirm its prestige in the world, and transcend the national humiliations of the past. Accordingly, de Gaulle urged French unity over divisive "partisan quarrels" and emphasized French heritage, including both the Ancien Régime and the Revolution. The French political figures most admired by de Gaulle "were those responsible for national consensus—Louis XIV, Napoleon, Georges Clemenceau—who saw as their goal the creation of political and social unity by a strong state." In order to strengthen France, Gaullists also emphasize the need for "a strong economy and a stable society." Gaullism believes, according to Berstein, that "it is the imperative of the state, as guardian of the national interest, to give impetus to economic growth and to guide it. Liberal opinion is accepted if it promises more efficiency than planning. As for social justice, so long as its natural distrust of big business can be allayed, it is less a matter of doctrine than a means of upholding stability. To put an end to class struggle, Gaullists hope to make use of participation, a nineteenth-century concept of which the general spoke frequently, but which he allowed his associates to ignore." As part of a strong state, de Gaulle emphasized the need to base state institutions on a strong executive. This was a departure from the French republican tradition, which emphasized the role of the elected assembly. De Gaulle, during his time in office, sought to establish authority by holding direct universal votes and popular referenda and by directly engaging with the nation (via speeches broadcast over radio, press conferences, and trips to the provinces). While de Gaulle frequently spoke on his respect for democracy, his political opponents perceived in his rule a tendency toward dictatorial power; many feared a Bonapartist revival or a republican monarchy. France remained a democracy, however, and de Gaulle's decision to step down as president following voters' rejection of the April 1969 constitutional referendum showed that his commitment to democracy was not merely a rhetorical ploy. In foreign policy, Gaullists are identified with both realism and French exceptionalism, and de Gaulle sought to impose French influence on the global order. Gaullists supported decolonization, which freed France from the burden of empire. This was reflected in de Gaulle's resolution of the Algeria crisis (1958–62), which was strongly influenced by de Gaulle's realpolitik, or "keen sense of political expediency." De Gaulle realized that decolonization was inevitable, and that a continued crisis and extended Algerian War would harm the French economy and perpetuate national disunity. Accordingly, "de Gaulle felt that it was in France's best interests to grant independence and desist from military engagement," thereby preserving French unity and grandeur. Gaullists emphasize the need for France to "guarantee its national independence without resorting to allies whose interests might not coincide with those of France." The development of independent French nuclear capability, undertaken at significant effort despite much international criticism, was an outgrowth of this worldview, while simultaneously initiating one of the first international nonproliferation efforts by quietly unshackling and distancing the French program from a diplomatically troublesome secret involvement with an Israeli junior partner attempting to demilitarize and open to international oversight the Israeli nuclear arms program. France under de Gaulle sought to avoid a post-World War II bipolar global political order dominated by the two superpowers of the United States and the Soviet Union, and sought to avoid dependence on the United States. Kritzman writes: "Gaullist foreign policy was motivated by its need to distinguish itself from … the two great superpowers. Paradoxically, [de Gaulle] desired to be part of the Western alliance and be critical of it at the same time on key issues such as defense." Most notably, de Gaulle withdrew France from North Atlantic Treaty Organization (NATO) military operations in 1966, and directed non-French NATO troops to leave France, although France remained a NATO member. Gaullists were also critical of the overseas economic influence of the U.S. and the role of the U.S. dollar in the international monetary system. Under de Gaulle, France established diplomatic relations with China earlier than any other Western nation; imposed an arms embargo against Israel (1967); and denounced American imperialism in the Third World. De Gaulle and the Gaullists did not support Europe as a supranational entity, but did favor European integration in the form of "a confederation of sovereign states mutually engaged in "common policy, autonomous from the superpowers," and significantly influenced by France. De Gaulle's hopes to advance this sort of union largely failed, however, "in the face of the desire of the other European powers to remain closely allied to the United States." De Gaulle's political legacy has been profound in France. De Gaulle's successor as president, Georges Pompidou, consolidated Gaullism during his term from 1969 to 1974. Once-controversial Gaullist ideas have become accepted as part of the French political consensus and "are no longer the focus of political controversy." For example, the strong presidency was maintained by all of de Gaulle's successors, including the socialist François Mitterrand (president 1981–95). French independent nuclear capability and a foreign policy influenced by Gaullism (although expressed "in more flexible terms") remains "the guiding force of French international relations." Berstein writes: "It is no exaggeration to say that Gaullism has molded post-war France. At the same time, considering that the essence of Gaullist ideas are now accepted by everyone, those who wish to be the legitimate heirs of de Gaulle (e.g., Jacques Chirac of the RPR) now have an identity crisis. It is difficult for them to distinguish themselves from other political perspectives." Not all Gaullist ideas have endured, however. Since the 1980s, there have been several periods of cohabitation (1986–1988, 1993–1995, 1997–2002), in which the president and prime minister have been from different parties, a marked shift from the "imperial presidency" of de Gaulle. De Gaulle's economic policy, based on the idea of dirigisme (state stewardship of the economy), has also weakened. As recently as the mid-1980s, the major French banks, as well as insurance, telecommunications, steel, oil and pharmaceutical companies, were state-owned. Starting in the mid-1980s and continuing through the 1990s and 2000s, the French government has privatized many state assets. ^ a b c d e f g h i j k l m n o p q r s t u v w x y z aa ab ac ad ae af ag ah ai aj ak Berstein 2001, pp. 307-308. ^ a b c d e f g h i j k Kritzman & Reilly 2006, pp. 51-54. ^ a b c d Henri Astier, French wrestle with De Gaulle's legacy, BBC News (April 15, 2002). Choisel, Francis, Comprendre le gaullisme, L'Harmattan, 2016. Jackson, Julian. De Gaulle (2018) 887pp; the most recent major biography. Kritzman, Lawrence D; Reilly, Brian J (2006). "Gaullism". The Columbia History of Twentieth-century French Thought. Columbia University Press. ISBN 0-231-10791-9. Touchard, Jean, Le gaullisme (1940–1969), Paris, Seuil, coll. Points Histoire.1978. Berstein, Serge (2001). "Gaullism". The Oxford Companion to Politics of the World second edition ed. Joel Krieger. Oxford University Press. ISBN 0-195-11739-5. Look up gaullism in Wiktionary, the free dictionary.